Whole system improvement—where the vast majority of schools improve—is difficult to achieve. Some jurisdictions use what turns out to be ‘wrong’ policy drivers like testing and evaluation. Rather, success turns out to depend on changing the culture of schools and their relationship to the infrastructure of policies and regulation. I examined the six cases studies in the light of whole system change criteria. Two of the case studies, South Africa and India, represent limited but useful examples in that they focus on basic skills like literacy. A second set of two studies, Escuela Nueva and LCP in Mexico, represent strong examples of how bottom up strategies can spread to significant levels. The final two, Long Beach in the US and Ontario, are strong examples of how deep change can be accomplished by focusing on a few core priorities and then building a culture over a number of years to support and sustain the changes. The paper then draws conclusions about the conditions that will be required for large scale change to occur. Gallagher, M. J., Malloy, J., & Ryerson, R. (2016). Achieving excellence: Bringing effective literacy pedagogy to scale in Ontario’s publicly-funded education system. Journal of Educational Change. doi: 10.1007/s10833-016-9284-6. New Pedagogies for Deep Learning. (2016). www.npdl.global. Rincon-Gallardo, S. (2016). Large scale pedagogical transformation as widespread cultural change in Mexican public schools. 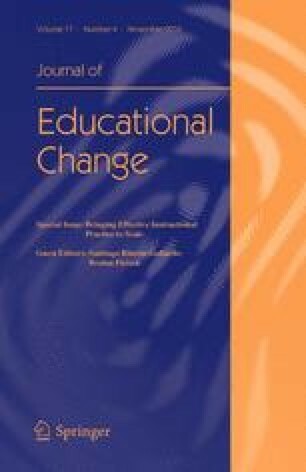 Journal of Educational Change. doi: 10.1007/s10833-016-9286-4.